When I decided to give up meat, it was a temporary plan. I never would have imagined at the time that almost a year later I'd still be living a meatless life. It didn't take long, though, for me to realize that as a vegetarian my food choices would come under scrutiny. I would be answering questions like "Why don't you eat meat?" and "Isn't it hard to get enough protein?" over and over again. I took these questions and other comments about my vegetarianism with a grain of salt. People are naturally curious, I thought. Yet I found myself getting tired of answering the same questions and defending my choices all the time. Why, I wondered, did I always felt like my choices needed to be defended? At least in part, I suppose it's a societal issue. Eating meat (or drinking caffeine, or being thin, for that matter) is the baseline, the status quo. Any choice outside that acceptable social norm makes others uncomfortable and therefore defensive of their own choice. (This probably has some roots as a survival instinct, though I haven't checked out the research.) And it doesn't help that corporations behind these products are always trying to convince us that we want, even NEED, to eat their meat, drink their beverage (Got Milk anyone?) or use their product. We accept that the norm is what it is and we rarely ask why or if it's the best option. I recently ate lunch at a table with several others and the topic of vegetarianism came up. A fellow writer told us a story about a teacher she once had who, upon being asked why he was a vegetarian, turned the question around on the student and wondered why vegetarians always had to answer that question but no one ever asked omnivores why they chose to eat meat. I mentioned how I often feel that my choice to not eat meat seems to make some people uncomfortable. It seems like my choice puts them on the defensive. As humans (and maybe particularly as Americans) we don't like to be told that our choice is "wrong", and if I'm not eating meat for any logical reason, then it seems I'm essentially telling them I'm right and they're wrong. The problem is, I don't feel that way at all. My choice is my choice. I'll respect yours if you respect mine. I understand their reaction, though. In fact, I find myself doing the same thing in different situations. It's like when someone says, "I'm trying to give up caffeine," and I automatically answer with, "I've thought about it, but I don't really drink that much caffeine anyway." It's as though I feel the need to defend my choice to drink caffeine despite the fact that the person I was speaking with didn't say anything to overtly imply that she was making a judgment on me. In fact, it's more likely that she was just making conversation. So why do I feel that the mere act of her giving up caffeine is a judgment on my choice to keep drinking it? And why do others feel that my meatless life is a judgment on their omnivore-ism? Is it because we feel, deep down inside, that our choice might not be the best choice after all? On Saturday, I spent the day mingling and networking with writers at the Maryland Writers' Association Conference. It was a great day filled with wisdom, laughs and interesting conversation. As always, I left the conference motivated and re-energized. Since I've told you all how I feel about writers' conferences and how beneficial I think they are, this time I thought I'd share a few of my favorite quotes and some of my take-away thoughts. The first session I attended was on Direct Marketing. Speaker Frank Joseph has been working as a direct market writer for decades and I figured if anyone could convince me that a cynic like me could write direct marketing content, it would be him. I'm not sure I came out of there convinced, but Frank had some great tips that I could apply to writing in general. My favorite quote from his talk was: "You can make money as a writer." He may have been talking about direct marketing specifically, but I'm applying his statement beyond that. I may try direct marketing at some point in my writing career, but just being reminded that I CAN make money writing was enough to put a smile on my face for the rest of the day. Next, I went to Ethics of Memoir. Author Marion Winik discussed her experience of memoir writing and how it has changed as she has grown and learned from the consequences of what she has written. My favorite quote from her talk was: "The act of writing about another person takes place first in a relationship. It can't help but affect that connection." Since I write mostly memoir, I found this talk extremely helpful in reminding me that I'm not writing in a vacuum. When I write about my life as it intersects with the lives of people who are important to me, what I write will inevitably influence those relationships in some way. It's best to bring those people into the folds before publication. Otherwise, even if what I write doesn't seem negative to me, the consequences may not be pretty. The keynote speech was given by Roxana Robinson, who said: "If someone else can't hear your voice, it doesn't mean you should stop. It means you should make it clearer." She also railed against the term "women's fiction", "because there's no equivalent for men." I wish I had written down her entire argument because it rang so true to me in so many ways. The basic gist was that it was demeaning, that just because a novel might be about family and written by a woman, doesn't make it inherently women's fiction. Would you call Hamlet women's fiction? Or Anna Karenina? I'm still mulling over what she said and wondering how the term women's fiction may be negatively affecting female writers and readers alike. After lunch I attended Mindie Burgoyne's talk on Viral Networking. While much of what she talked about (networking on Facebook, Twitter, LinkedIn, etc., effectively) was stuff I already knew, I did glean a real gem: "Make sure you're giving fans/followers content they want, NOT what you want them to have." This is something I struggle with sometimes, particularly because my time for social networking is limited. I'm working on it, though. The last session I attended was on setting. Lalita Noronha discussed how she uses setting to put the reader in the center of her stories, which are often set in exotic locales like her native country of India. Noronha reminded us that: "The 'where' and the 'when' can be as important if not more important than the 'who'. We make judgments on the who based on where and when." I've always loved the way Noronha describes setting with just enough detail to bring me into the story, but not so much as to distract from the story itself. I'll be spending some time rereading her stories and studying her technique over the next few weeks. I may not write much fiction, but my nonfiction writing could certainly benefit from some effective scene setting. Those are just a few of the lessons I took home from this year's MWA conference. Feel free to share your thoughts on any of the topics I mentioned, or share some of the writing lessons you're learning these days. I'm coming up on my first Vegiversary, and even after almost a year of eating a vegetarian diet, I still struggle some days to get enough protein. So when I received a packet of CLICK Espresso Protein Drink in my Fitbloggin'10 swag, I was psyched to give it a try. I mean, protein AND caffeine in a shake! What's not to like, right? Unfortunately, my initial experience with the Vanilla Latte flavored CLICK Protein Drink was less than stellar. I didn't have a shaker and didn't think to use a blender, so I tried mixing it in a cup with a spoon. NOT. GOOD. It was grainy, clumpy and just plain gross. I was going to write up a negative review and let it go at that, but thankfully I didn't. On the drink-mix packet was an offer to receive a CLICK Pack (a shaker and a canister of the CLICK Espresso Protein Drink), so I decided to take them up on it and give CLICK another try. When my CLICK pack arrived, I didn't hesitate to make my first shake, but I made sure to use the shaker to mix it. I found the flavor to be much better and the consistency to be much smoother. I didn't stop there, though. The canister gave me plenty of opportunities to try different preparations and I went all out in sampling CLICK this time. First, I made it just using cold water. Then I tried it as a frozen shake, adding ice and blending it. I tried it a third time using an immersion blender to mix in half a banana. I haven't tried it warm yet, but I imagine it wouldn't be bad that way either. My favorite preparation so far has been the frozen shake, but it's much easier to just shake it up, add some ice and hit the road with a protein filled breakfast. Overall, I found CLICK refreshing and tasty, with great espresso flavor, and would recommend you give it a try. With only 120 calories, 15g of protein, and less than 2g of fat per serving, it's a simple, low calorie, low fat addition to your diet. Especially if you need an extra protein kick. CLICK is also low in sodium and added sugar, so you won't be getting a bunch of crap in your diet along with the good stuff. CLICK does have additives like maltodextrin and quar gum, so I wouldn't recommend a daily CLICK-fix, but I think it's fine as an occasional way to get your protein (or caffeine). If you're sensitive to caffeine, I'd also avoid drinking CLICK as an evening snack or dessert. I tried this without thinking one night, and the double shot of espresso kept me up much of the night on a caffeine high. The first 25 people to email me at writingherlife at gmail dot com with "I want to CLICK it!" in the subject line and your mailing address in the body will receive a free packet of CLICK Espresso Protein Drink. One (1) lucky winner will receive a full CLICK pack, including a shaker and a canister of CLICK Espresso Protein Drink. For an additional entry, tweet "I want to win a CLICK pack from @drinkclick and @smtwngrl! http://tinyurl.com/27aud6s" and leave an additional comment letting me know you tweeted it. Contest ends Wednesday, April 28th at 11:59PM and I'll randomly select a winner (using Random.org) from the eligible comments on Thursday, April 29th. I'll email the winner and he/she will have 24 hours to contact me with a mailing address. If the winner doesn't respond a new winner will be drawn. 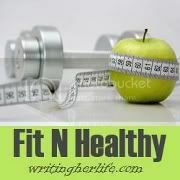 Disclaimer: I received a free sample of CLICK at FitBloggin' and was provided with a free CLICK pack for review. I am not, however, receiving any compensation for writing this post. The prize offered in this post is provided by CLICK. How Active Has Your April Been? When I started the Active April challenge, my plan was to be much more active than I've managed to be thus far. I can't imagine how this month would have panned out if I wasn't participating in Active April and trying to motivate others, too. ...on at least 25 of 30 days. According to my trusty Gruve charts and my Google calendar, I've met my activity goal on 17 of 21 days. Technically, I guess that means I'm on track to meet my goal if I stay committed and make sure I'm getting active for at least 6 more days this month. That doesn't seem too tough. In fact, now that I've actually evaluated my activity for the month, I'm feeling a little better about my performance. I guess that's one of the great things about tracking your progress. It makes noticing improvements and recognizing successes easier. Have you been tracking your activity this month? How are you doing? Have you been as active as you'd like? If not, what can you do over the next 9 days to make April an active month? Thanks to everyone who participated in the Active April Challenge for the support and for posting your progress on Twitter using the #ActiveApril hashtag. It's been fun (and motivating) to see how you're getting active and cheer you on. Since we don't have much time left in April, I'm already thinking about my goals for May. If you'd be interested in a challenge again next month, feel free to leave me a comment or give me a shout-out on Twitter. I'd love to host a monthly health challenge if others are interested in joining me! The winner of the thriv basic tee is Kelliscakes! I'll be emailing her and she will have 24 hours to respond with her shipping info and shirt size. If she doesn't get back to me by 2PM Saturday, I'll pick another winner. Hurry, though, because they both end today! When a book is recommended to me multiple times over the span of a couple weeks, I take that as a sign from the Universe, head straight to the used bookstore or Amazon or paperbackswap.com and dive in. That's what happened with Writing Down the Bones by Natalie Goldberg. I used to love reading books about writing, but eventually I got tired of reading the same old writing advice over and over again. It may come in different packages, but it usually says the same thing. Not so with Writing Down the Bones. 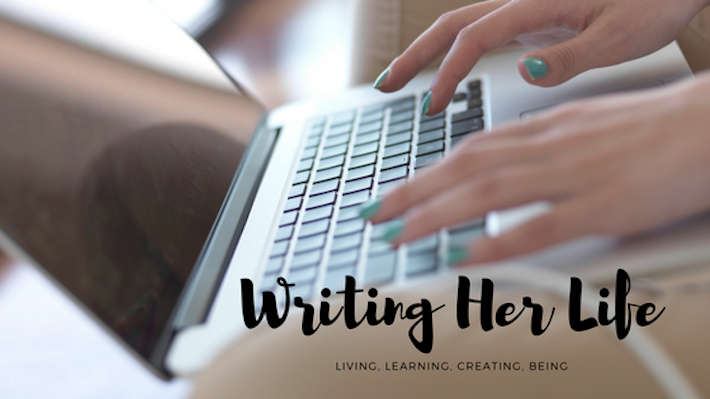 Sure, there's some the standard writing advice in there, but there's also advice on the writing life, on finding your center, on knowing yourself. Each chapter is short and sweet, making it a quick read, but I read through the entire book slowly, chewing thoroughly on every nugget of insight. The surface advice was enough to make WDB worth the read, but the deeper lessons made it an invaluable resource. Unlike some of the writing books I've read in the past and then passed on to others, this one will stay in my library and be well-worn in no time. Some days I just pick it up and thumb through, randomly choosing a chapter to read. It never fails to refresh me, inspiring my writing, motivating me to get to work or to take a new look at an old idea. If you're a writer (or want to be one) and you haven't read Writing Down the Bones , I highly recommend you pick it up. As you know by now, I snagged some excellent swag from FitBloggin'. One of the things I received was a FitBloggin'10 t-shirt from thriv. I'd never purchased or worn any of thriv's products before. In fact, I'd never heard of thriv until FitBloggin'. But the moment I picked the shirt up I knew I was going to be a fan. Made from bamboo and cotton, the shirt not only fits me perfectly, but it's also the softest, most comfortable t-shirt I've ever worn. It turns out that softness and comfort comes from the flex-fiv: thriv's patented technology that transforms bamboo and cotton to deliver 5 benefits: wicking, comfort, SPF, anti-odor, and breathability. Even after washing it a few times, it's still soft and fitted. The thriv products have been available in stores and online at Sports Authority, but now thriv has their own online store. And to celebrate their online grand opening, thriv is giving away a tee to one of my readers! To win a ladies' basic tee (or a men's tee if a guy wins), all you have to do is visit the thriv website and then come back here and leave a comment letting me know what you think of the company or their product line. The contest will close on Thursday, April 15 at 11:59 PM. I'll draw and post the winner on Friday, April 16. If you win, you'll need to contact me within 24 hours with your name, address, and shirt size (Ladies XS-XL, Men's M-XXL), which I'll pass along to thriv so they can send you your shirt! Disclaimer: I received a free t-shirt from thriv at FitBloggin'. I am not, however, receiving any compensation for writing this post. The prize offered in this post is provided by thriv. This weekend I took the Metro into DC to visit with Alexis of The Traveling Writer. It was a beautiful day and we decided it was a perfect opportunity to head to the park and go "hiking". To a hiker, it probably would have seemed more like walking, but to someone used to neighborhood walks and treadmill hills, it was a hike. Trust me when I say this. The conversation was so great that we ended up walking for about two hours without even realizing how much time had passed. By the time we made our way out of the park (and up another REALLY steep hill), we were starving and our legs were screaming. A little sweaty, but too hungry to care, and with legs getting stiffer by the second, we hopped on the Metro and headed to Dupont Circle for brunch at Kramerbooks & Afterwards. This place is ingenious! If you've never been there and are in the DC area, you should check it out. It's a bookstore and cafe under one roof, which seems pretty common place -- except that Kramers serves real meals, not just coffee, muffins and the odd sandwich or soup. Their Saturday brunch included a full menu of options (everything from French toast to omelets to sandwiches) to choose from. I can't vouch for all the other dishes, but I had the Tomato Avocado Cafe Benedicts which was delicious, and I didn't even feel bad eating the fried potatoes after all that hill-walking. When we were finished eating, we couldn't help but hang around and browse the bookstore, which I'm sure is exactly what they expect their Cafe patrons will do. Considering the bookstore's relatively small size, the selection had more variety than I would have expected. It's the type of bookstore you could spend hours browsing in. Our legs weren't up for that, though, so we headed back, Alexis to do some reading and writing and me to make the trip back to Baltimore. Despite the sore legs, it was a wonderful day and I was reminded just how much I love being active and enjoying nature. It's so much more fun then trudging along on the treadmill indoors (at least until it gets to be 90 degrees outside). When I got back home, I plugged in my Gruve to see how the day worth of walking translated into calorie burn. I was shocked to see that in those two hours of hiking I burned about 500 calories and between 8AM and 6PM I had burned 1,000 calories! That's in contrast to the average 450 calories per day I burned the rest of the week. Talk about an Active April! Speaking of which, if you're still interested in joining the Active April Challenge, you can set your goals and jump in any time. We even have a button now, thanks to Mel! Yesterday I posted about my desire to get (and stay) active in April. A few readers showed interest in joining me, so I thought I'd make this an official challenge. That way we can all motivate and cheer for each other throughout the month as we get lazy our motivation wanes. Set your own activity goal for the month (or the remainder of the month if you're joining after the 1st). Leave a comment on this post that details your goal. Or if you want, write a post about the challenge and your goal at your own blog linking it back to this post, and then leave the link to your post in the comments. Tweet about your activity using the hash tag #ActiveApril so that we can all stalk you if you haven't reported in a while cheer you on). If you don't have a Twitter account, feel free to comment here on a regular basis to keep us posted on your progress. Visit each others' blogs and/or reply to #ActiveApril tweets and encourage each other. That's it. Set a goal, tell us what it is, report on your progress, and cheer each other on. It's a simple challenge to get us moving now that spring is almost here. Let's get active! P.S. I know challenges usually come with buttons, but I'm not that design-savvy and I didn't think up this challenge in time to put a button together. If you're joining in and you enjoy that sort of thing, feel free to come up with something and send it to me. I'll gladly post it to share with the challenge members (and give you props, of course). *UPDATE: If you're participating in the Active April Challenge, you can now grab the Active April button below (thanks to Mel at Mel's Box of Chocolates).